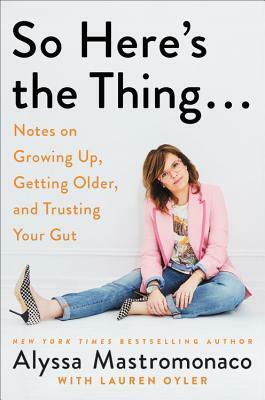 Alyssa Mastromonaco is back with a bold, no-nonsense, and no-holds-barred twenty-first-century girl's guide to life, tackling the highs and lows of bodies, politics, relationships, moms, education, life on the internet, and pop culture. Whether discussing Barbra Streisand or The Bachelor, working in the West Wing or working on finding a wing woman, Alyssa leaves no stone unturned...and no awkward situation unexamined. Like her bestseller Who Thought This Was a Good Idea?, SO HERE'S THE THING... brings a sharp eye and outsize sense of humor to the myriad issues facing women the world over, both in and out of the workplace. Along with Alyssa's personal experiences and hard-won life lessons, interviews with women like Monica Lewinsky, Susan Rice, and Chelsea Handler round out this modern woman's guide to, well, just about everything you can think of.